A stellar October Business Month (OBM) is over for another year. This year’s OBM delivered a fantastic line-up of inspirational speakers and events, with a new format that saw over 100 events held across the Territory with around 6500 attendees. Events included talks from some of Australia’s leading industry experts including Janine Allis founder of Boost Juice and investor on Shark Tank and Mark McCrindle, award winning social researcher. Marketing and social media was a key theme for OBM 2016 and attendees were taught how to develop and implement advanced social media marketing strategies to get results at the Upskills: Advanced Social Media session in Alice Springs and Tennant Creek. 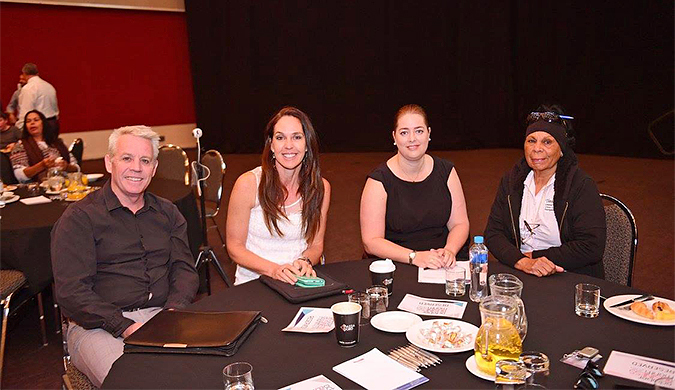 Central Australian events were well supported including a presentation by the Northern Territory Indigenous Business Network showcasing local Indigenous business members and opportunities for business connections. A highlight of this year’s program was the celebration of Territory business success stories through the Our Territory Heroes series. OBM would not be possible without the hard work and creative input of the Department of Trade, Business and Innovation, and the valued support of the Northern Territory business community and OBM sponsors. Darryl Thomas, Janine Allis, Susie Dark and Kumalie at the Alice Springs Official Opening of October Business Month.